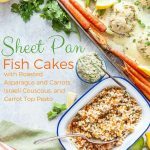 These Sheet Pan Fish Cakes with Vegetables, Israeli couscous, and Carrot Top Pesto are a healthy and delicious meal that is perfect for a light weekend or weeknight dinner. Great to meal prep and have for lunch throughout the week. 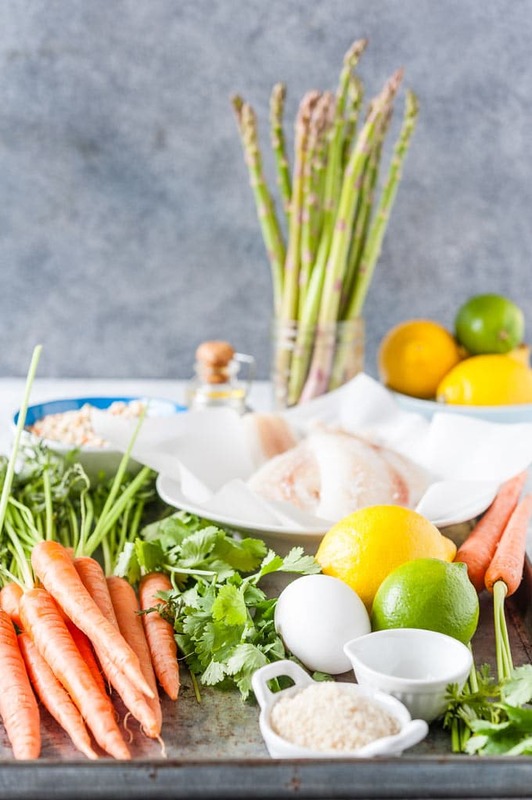 Perfect recipe to celebrate all the fresh flavours of Spring. 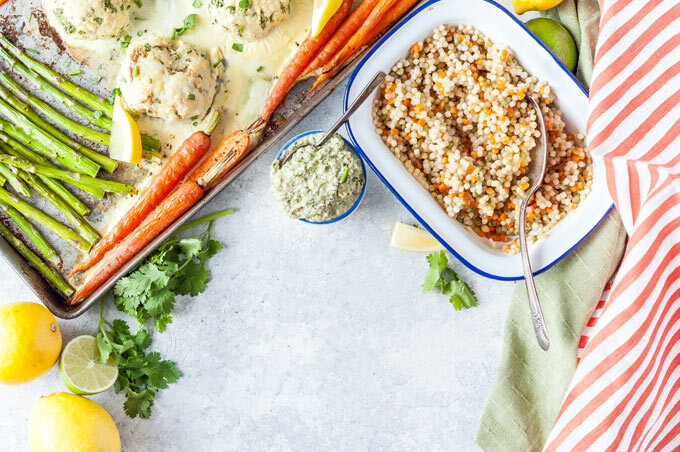 There’s something magical about getting a full meal done on just one sheet pan, don’t you think so? 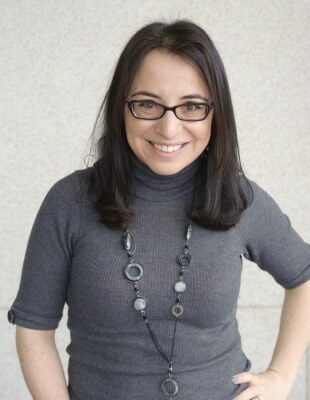 When I was working in the office my routine used to be coming home from work, turning on the oven, then thinking about what to make for dinner. I love the idea of not needing to stand at the stove, flip, stir, watch. I love putting food in the oven and relaxing in front of a television. Correction: I loved relaxing in front of a television, now I either go back to my computer to keep working or try to keep my toddler alive. 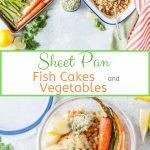 These Sheet Pan Fish Cakes with Vegetables and Israeli Couscous were an attempt to entice my toddler to eat fish. Spoiler alert: I failed. She actually loves fish in my Instant Pot Fish and Potato Soup but after she ate almost a whole fish cake the first time I made this meal, she refused to even try a bite the next few times I cooked it. I, on the other hand, love fish cakes. My mom used to make fish cakes quite often, that was almost the only way we ate fish when I was little. 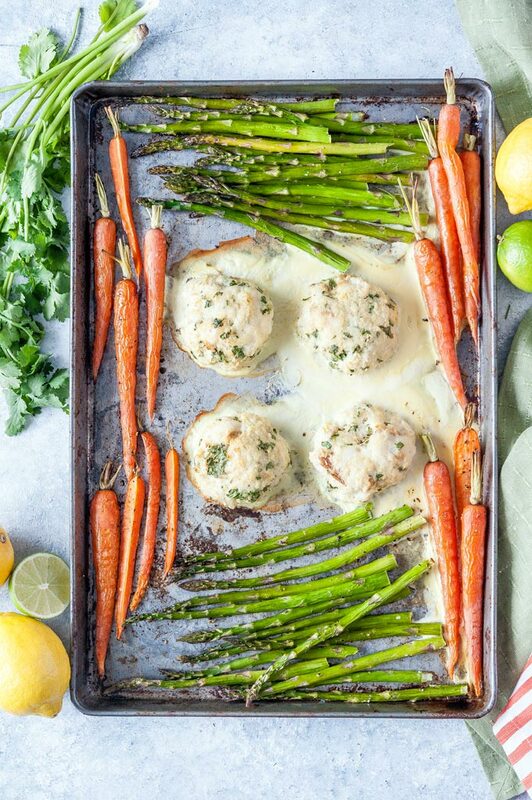 For this recipe, I decided to turn simple fish cakes into a gorgeous and delicious sheet pan meal, complete with aforementioned fish cakes, roasted young carrots, roasted asparagus, oven-baked Israeli couscous (yes, that’s right, it’s cooked right in the oven, no need to watch the pots here either), and carrot top pesto. 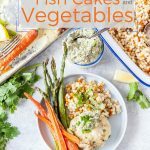 These oven-baked fish cakes with vegetables and Israeli couscous are a healthy and delicious meal that is perfect for a light weekend or weeknight dinner. Great to meal prep and have for lunch throughout the week. Making fish cakes is not complicated at all but you need a food processor. The main thing is to have all your ingredients ready and then just combine and blitz a few times until a smooth mixture forms. I usually use frozen and defrosted fish when making fish cakes, so it’s important to fully defrost the fish and squeeze as much liquid out as possible. If there’s too much liquid in the fish, then it’ll run out of the cakes when they are baked (you can see in the photos), which is actually fine and not a problem at all but it’s more aesthetically pleasing when the fish cakes are more firm. Another option to make the fish cakes firmer and not have the liquid run out of them is to add more breadcrumbs. For this particular recipe I wanted to keep breadcrumbs to a minimum but feel free to add more breadcrumbs for firmer texture. There are only a few ingredients to make Fish Cakes. 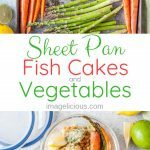 Most of the ingredients for these Sheet Pan Fish Cakes can be changed up to suite your taste. I usually use frozen, defrosted, and then squeezed out cod. 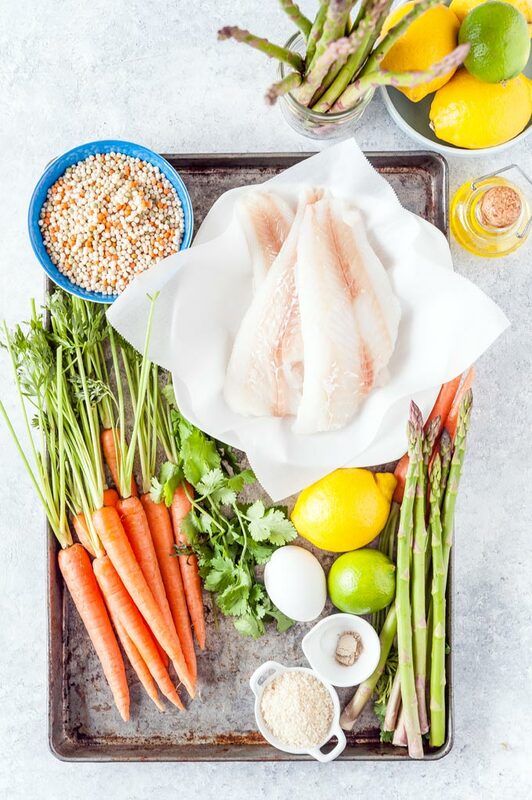 You can use haddock or tilapia in place of cod. Egg can be omitted if you follow egg-free diet. I really like lime or lemon with fish, to me they are an absolutely integral ingredient. I used lime just because I wanted some variety but you can use lemon if that’s all you have. Cilantro has a very strong flavour and not everyone likes it. Some say cilantro tastes like soap but I absolutely love it. If you don’t like cilantro or if you don’t have it, feel free to use dill or parsley. 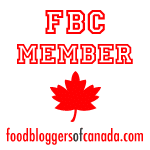 You can use regular breadcrumbs instead of Panko breadcrumbs. Also, you can double the breadcrumbs for firmer texture. Seasonings are very personal. I use just simple salt and white pepper (my new favourite ingredient) but feel free to use your favourite spices. You can add some cayenne pepper for extra heat, add some onion powder or garlic powder. 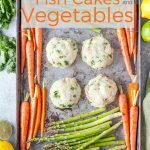 When I was first developing this recipe, I made Sheet Pan Fish Cakes with Carrots and Asparagus and loved the meal immensely. But something was missing. It was delicious and healthy and light. A bit too light. That dinner definitely needed some carbs. Well, I have a carb-loving belly so I missed them in this meal. 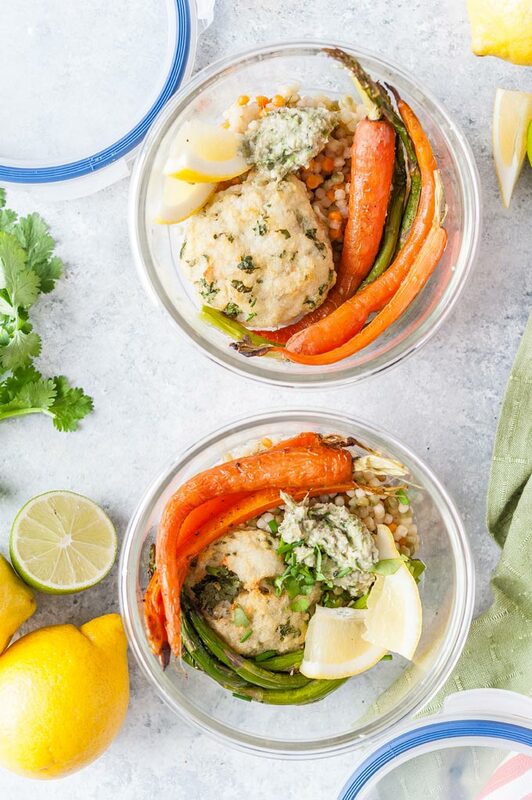 I started brainstorming some ideas and thought that Israeli Couscous (or Pearl Couscous) would work perfect with the fish cakes and vegetables. If you’ve never tried Israeli Couscous then I strongly urge you to run to the store right now and buy a package. Israeli Couscous is basically pasta in the shape of little balls and it tastes delicious both cold and hot. Usually it is cooked on the stove and boiled in water until the spheres are fully cooked, doubled in size and most of the water is absorbed. It is an easy and traditional method of cooking this kind of couscous but it requires you watching the pot of water. I decided to see if Israeli Couscous (or Pearl Couscous) can be cooked in the oven and it turned out it can and it’s very easy. 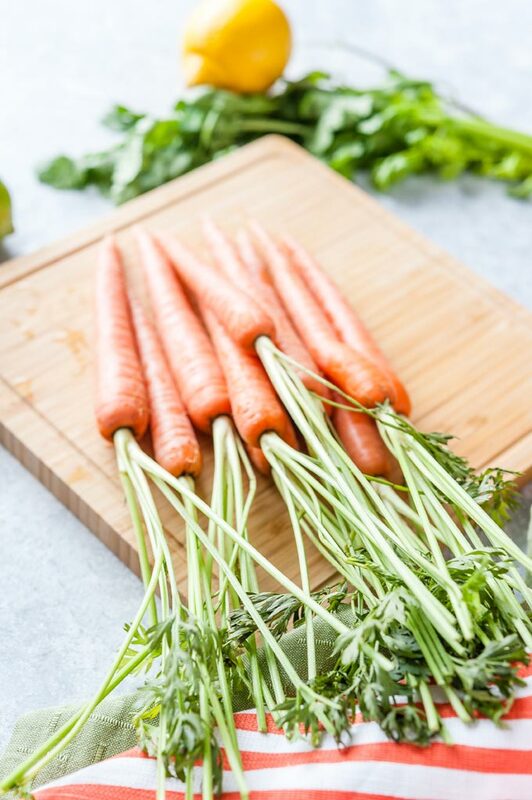 Since the recipe uses a bunch of young carrots, it is usually sold with carrot tops still attached. Instead of throwing out the tops, you could make carrot top pesto with them. And yes, you can eat carrot tops. 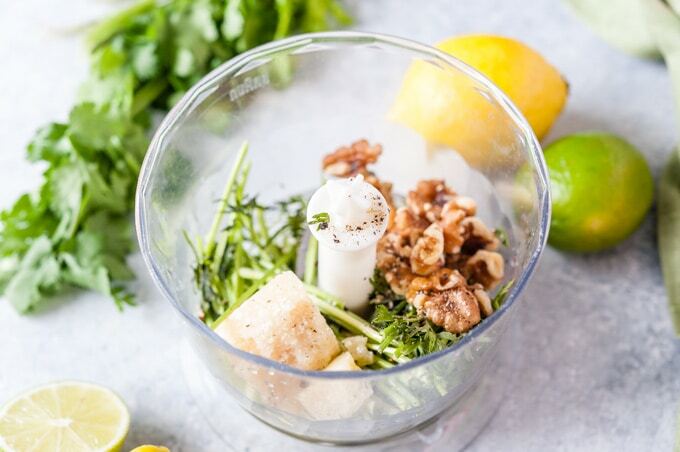 All you need is to mix all the ingredients such as carrot tops, walnuts, parmesan, oil, lemon juice, olive oil, and a bit of water until you get the right consistency. You can make it more chunky by only pulsing a few times or you can make it smooth by processing for longer. Note: I prefer thicker pesto so I don’t add too much oil or water. For thinner pesto, add more oil to get the desired consistency. Pesto is very versatile and can be changed up quite a bit. Since this is a recipe for Carrot Top Pesto you can’t really omit or change up this ingredient. However, if you prefer, you can use different herbs such as basil, parsley, dill, or cilantro. I like the slight bitterness of walnuts but you can use other nuts. Feel free to use pecans, almonds, hazelnuts, or pine nuts. Half of the time when I make pesto I do not add parmesan, so it can be omitted. You can use Pecorino Romano or Grana Podano instead of parmesan. Do not use powdered parmesan though. You need the real deal here if you use it. Use either lemon juice or lime juice. For a tangier Carrot Top Pesto, add some lemon or lime zest also. I don’t like using too much oil when I make pesto, so I keep it to 2 tablespoons only but more authentic versions would definitely use more oil, so add as you desire. Because I don’t use too much oil, I usually add 1 or 2 tablespoons of water. Feel free to omit and/or replace with extra olive oil. 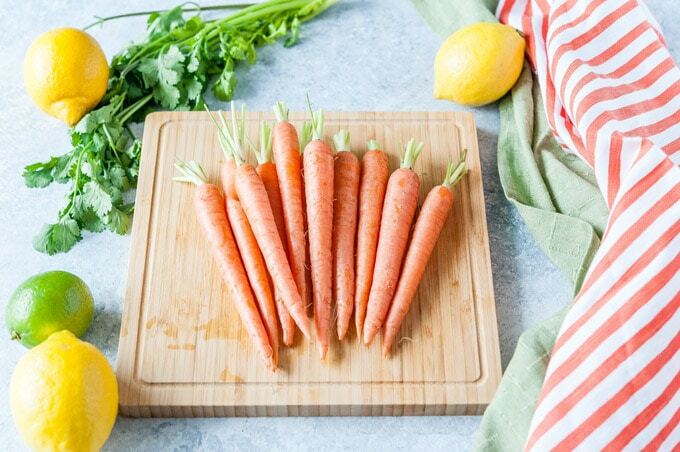 Young carrots are much thinner than regular carrots that are found in plastic bags in supermarkets. Because those carrots are so thin, they actually get to cook in only 30 minutes. I still prefer to cut bigger ones in half lengthwise. I personally prefer much softer asparagus, so cooking it for 30 minutes is just absolutely great. Confession: I often cook my asparagus for even 40 minutes. Don’t judge me. 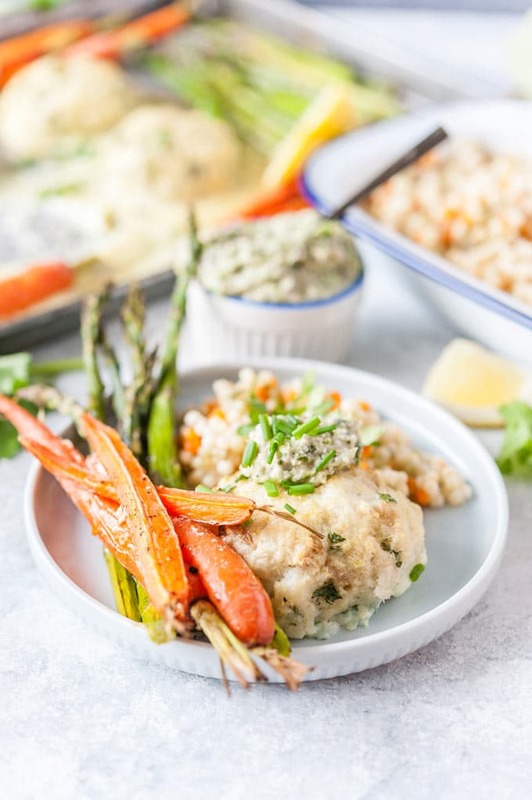 If you prefer crunchier asparagus, then start baking these Sheet Pan Fish Cakes with Vegetables without the asparagus and add the asparagus to the sheet pan 15 minutes later, when you put your Israeli Couscous into the oven. 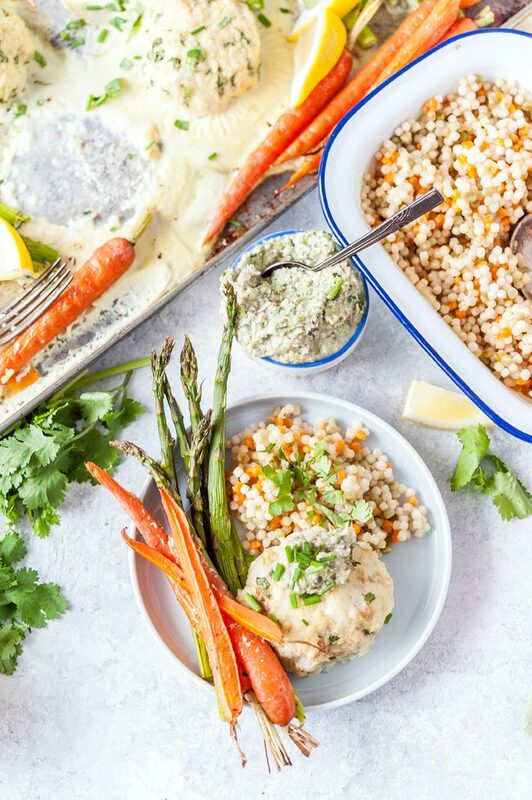 Now that we talked about all individual components, let’s discuss how to make this whole meal of Sheet Pan Fish Cakes with Carrots and Asparagus, Israeli Couscous, and Carrot Top Pesto. It sounds complicated but it really is easy. Start by preheating the oven to 425F. Clean up the asparagus and carrots, keep the carrot top. Add the vegetables to the sheet pan and lightly drizzle with a bit of oil and season with salt and pepper. Mix a bit with your hands or a fork. 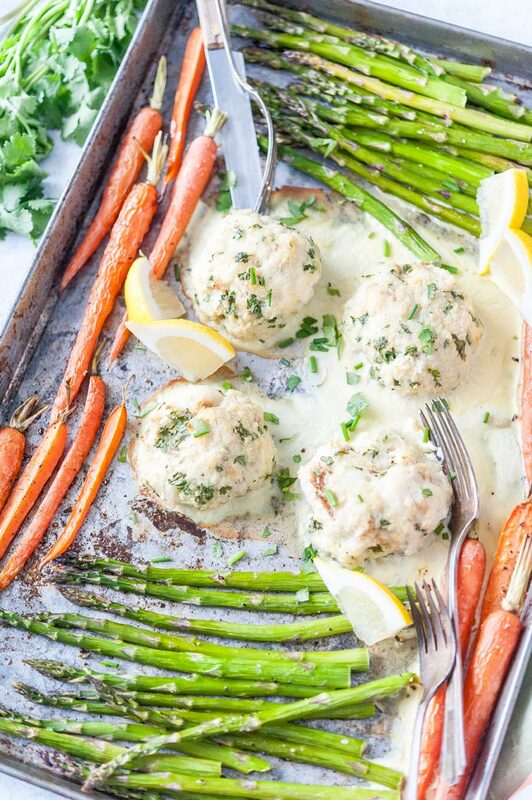 Leave space in the centre of the sheet pan for the fish cakes. 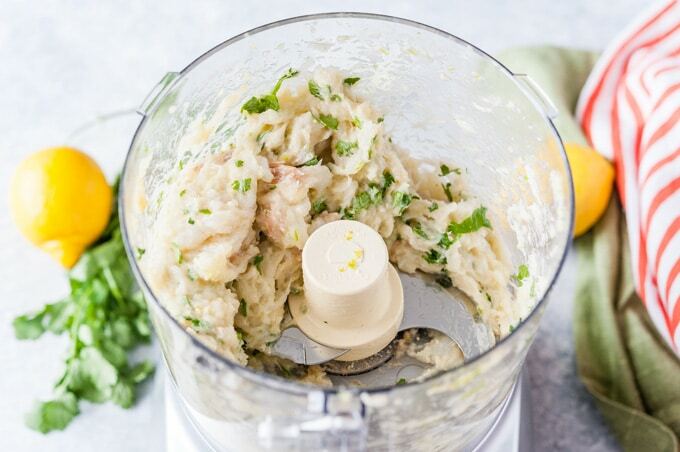 In a large food processor, combine all the ingredients and pulse a few times to get a smooth mixture. Form four fish patties and place in the centre of the oiled sheet pan. Spray with a bit of cooking oil. Bake for 30 minutes. While the fish cakes and vegetables are baking, make carrot top pesto. Combine all the ingredients in a small food processor and pulse a few times. If carrot top pesto is not your thing, you can also make Carrot Top Relish. Boil your stock for Israeli Couscous. I use Better Than Bouillon paste so I just dissolve it in boiling water. 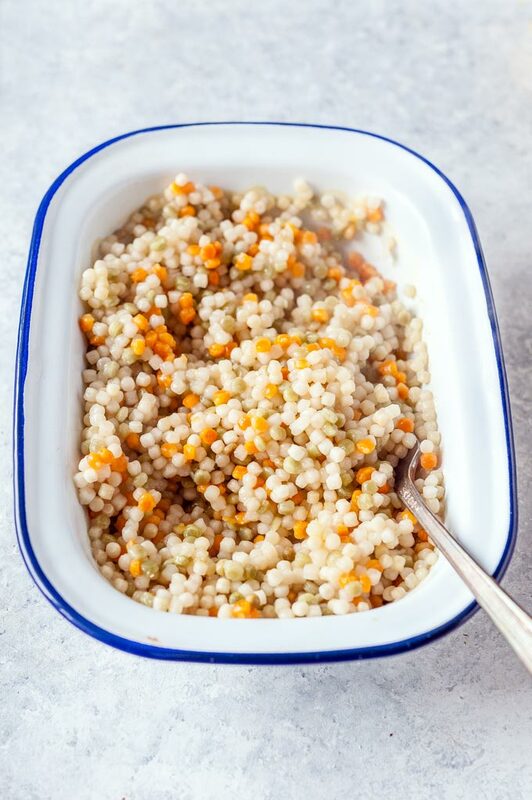 Add dry Israeli Couscous to a shallow roasting pan, cover with boiling stock and bake in the oven for 15 minutes. Did you know I actually wrote a whole cookbook dedicated to recipes made in the oven? 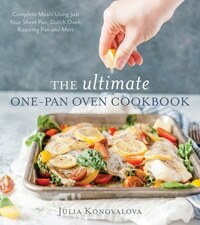 It’s called The Ultimate One-Pan Oven Cookbook and it has 75 original recipes with half of them made on sheet pans. Meal prepping for me is a relatively new beast and I don’t meal prep too often. However, I can definitely appreciate the beauty of meal prepping. With a few extra steps up front, you actually save time on making lunch. You save money. You don’t over eat. And you eat healthier. 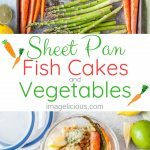 This particular recipe for Sheet Pan Fish Cakes with Vegetables is absolutely perfect for meal prepping. It tastes great hot and cold and nothing gets soggy after reheating. 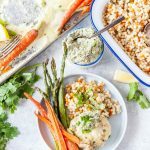 The recipe makes 4 servings, so into each container add 1/2 cup cooked Israeli Couscous, one fish cake, 2-3 carrots and 4-5 spears of asparagus. If you are planning to heat up this meal, then add a big spoonful of carrot-top pesto in a separate small container. If you are going to eat the fish cakes with vegetables cold, then feel free to add the pesto right on the main meal prep container. Add a few wedges of lime or lemon and you are all set. I use these glass containers for my meal preps. As I mentioned, I don’t have too many meal prep recipes, so you could check my tips on meal prep and batch cooking in this Steak and Mushroom Salad post. 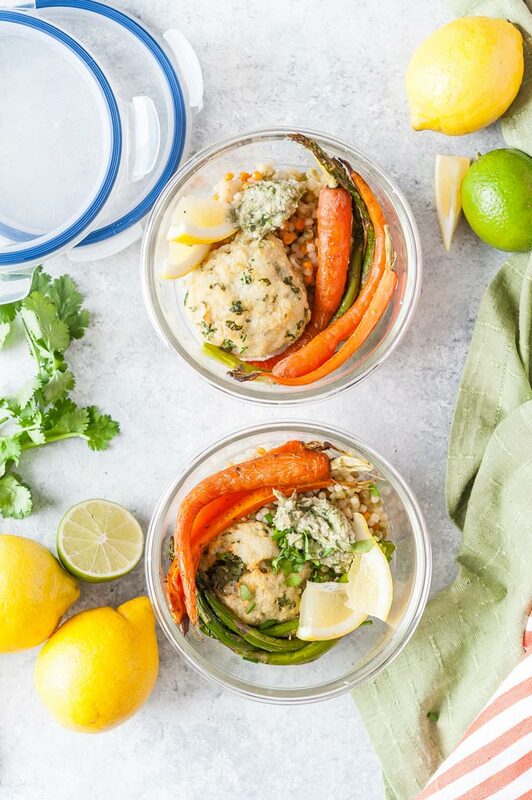 Or, check out this totally amazing e-book about Meal Prep Basics from my friend Carmy of Carmy – Run Eat Travel, she’s incredible with meal preps and has tons of ideas, tips, and suggestions. I am not big on specialized equipment and especially on using a few different kinds for one recipe but here you need two food processors. Small hand food processor for making pesto. The model I have is actually discontinued but I love the brand and I’ve been using it for more than 10 years now. Half sheet pan. I obviously used a different kind for the photos but this is one of my favourite brands of sheet pans. Small enamel roasting pan for baking Israeli Couscous. I actually don’t know if any other pan would work as I only tried my enamel roasting pans. Glass food storage container for meal prep. I use this brand almost exclusively, both plastic and glass containers. 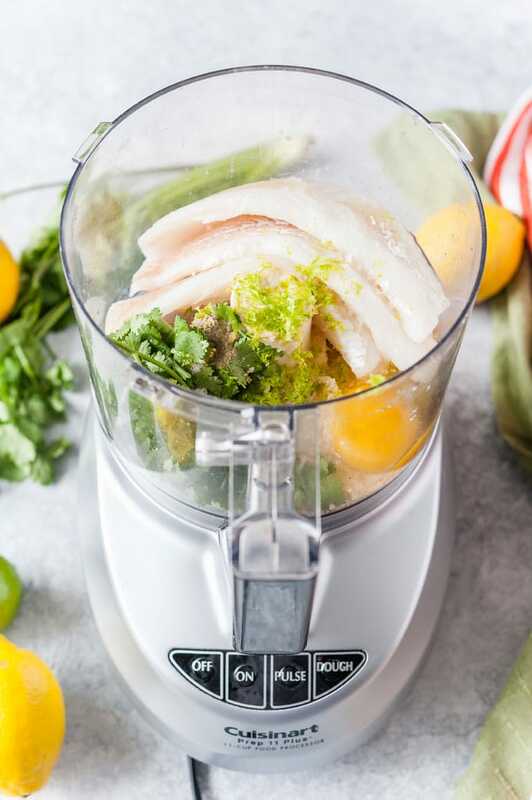 Combine all the ingredients for the fish cakes in a food processor and process until a semi-smooth mixture forms. Don't make it into a complete paste. Note: make sure to squeeze the fish out a bit. Add extra breadcrumbs if you prefer firmer texture and don't want the juices from the fish cakes to run. Cut the bottom woody ends off asparagus. Cut the tops from the young carrots, leaving half an inch of greens on the carrots. Save the carrot tops for the pesto. Cut the bigger carrots in half lengthwise. 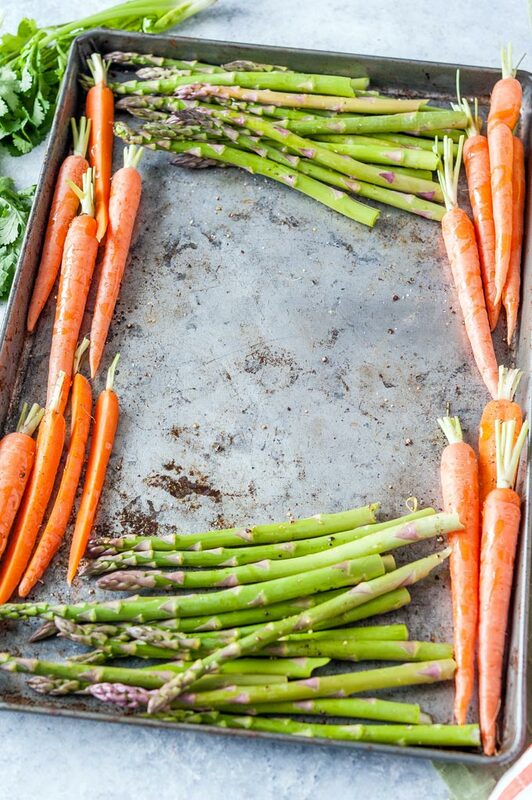 Add asparagus and carrots to the sheet pan, drizzle the remaining tablespoon of olive oil over the vegetables, season with salt and pepper to taste and mix. 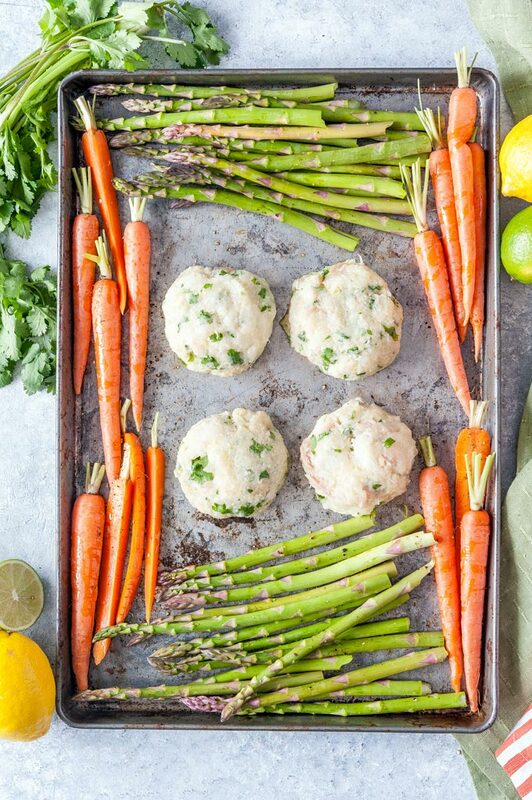 Arrange the vegetables near the edges of the sheet pan, leaving the centre for the fish cakes. Form four even fish cakes and place them in the centre of the prepared sheet pan. Spray the fish cakes with a bit of cooking spray (optional). Bake in the oven for 30 minutes or until the fish cakes are fully cooked and reached. I prefer 160F. 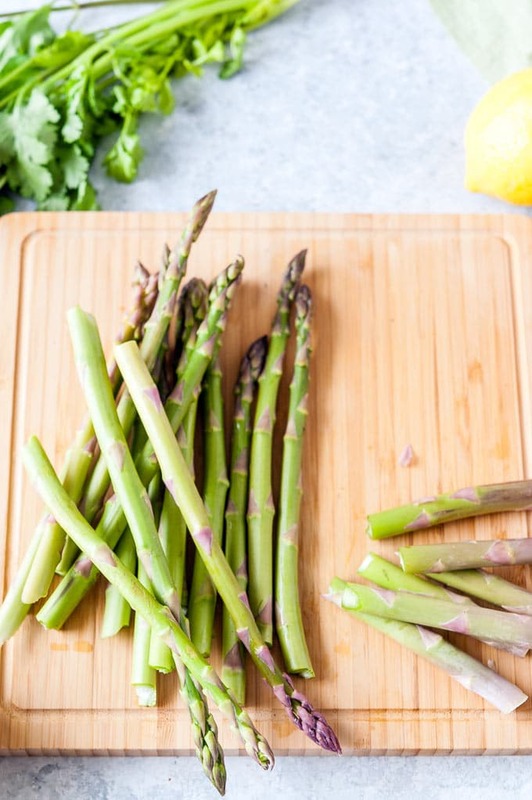 Note, if you prefer your asparagus to be crunchy, then start cooking without asparagus in the pan and add it to the sheet pan after 15 minutes, so that it only roasts for the remaining 15 minutes. 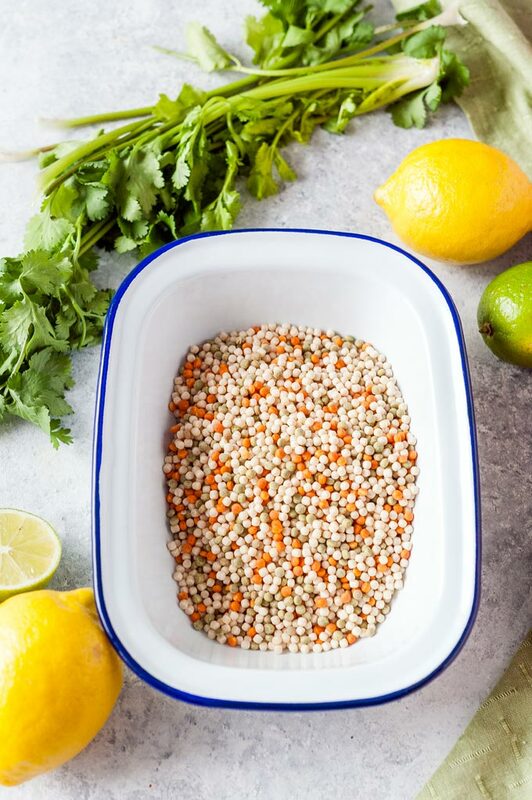 Add dry Israeli couscous to a small shallow roasting pan (1 litre capacity). Pour boiling stock over the couscous. Bake for 15 minutes. All liquid should disappear. Once done, fluff with a fork. Add the tops from the bunch of carrots to a small food processor, add the rest of the ingredients and pulse until the desired consistency. Note, you may want to add more oil or more water to make the pesto thinner if you'd like.